A consultation will take place to discuss treatment options for you child. A brace specifically chosen for your child’s smile will be comfortably fitted by one of our clinicians. We will be there through every step of treatment to ensure your child gets fantastic results. The best time to receive orthodontic treatment is as a child. Although it is possible to straighten your smile at any age, the best time to receive orthodontic treatment is as a child. 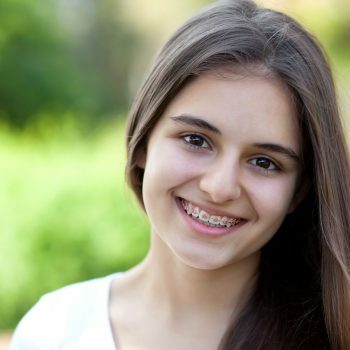 Potential problems can be corrected at the earliest stage with children’s braces, which has been proven to be beneficial in achieving the desired result, and you can avoid having to wear braces further down the line! Early, interceptive orthodontic treatment can be performed on children from 7 years old, and typically lasts between 8-12 months. It can be used to correct problems such as overbites, underbites, crowding and protruding teeth at an early stage, which can make later treatment much less complicated, or even make it possible to avoid it all together. As recommended by the American Association of Orthodontists, Hampstead Orthodontic Practice advise that children attend their first orthodontic screening from age 7. During your child’s initial consultation, we can then evaluate front-to-back and side-to-side tooth relationships to detect any possible overbite, underbite, or overcrowding issues. It may be that immediate treatment, or any treatment for that matter, is not necessary. However, if treatment is needed, we can then establish a personalised treatment plan for your child, which may include fixed or removable braces.